Today I found a collection turquoise blue foil wrapper roses that I’d made out of Trader Joe’s Dark Chocolate Honey Mints sitting on my desk. I’d made the roses out of the beautiful blue foil wrappers from the mints based on the Ferrero Rocher foil roses. 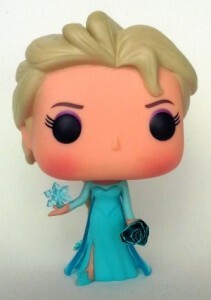 I realized looking at the roses that they were a perfect match to Elsa (from Frozen) and that they would go perfectly with the cute Funko Pop Elsa Figure that my daughter has as you see here. The craft tutorial that resulted is on Make a Beautiful Blue Elsa Frozen Foil Wrapper Rose. These are also known as Ferrero Rocher Rose or Hershey’s Kiss Rose done with the foil wrappers. These beautiful irridescent blue foil wrapper roses look like Queen Elsa’s dress. The roses are fun craft idea or party decoration for any Elsa from Frozen Fan, especially if you get to make them after eating the mints. Have fun making your own collection of beautiful blue Elsa foil wrapper roses. Like this article? Sharing, Linking and Pinning are welcomed and encouraged. Why do We love Disney Pixar Inside Out’s Sadness? With Prime You Get Free 2-Day Shipping! This website includes affiliate links and advertisements from our partners Amazon, Google and others. Our affiliate relationships allow us to contribute to projects and activity that promote healthy children, tween and teen activities. The Costume Detective is a participant in the Amazon Services LLC Associates Program, an affiliate advertising program designed to provide a means for sites to earn advertising fees by advertising and linking to Amazon.com. © 2014, 2015, 2016 The Costume Detective. Linking and Pinning are welcomed + encouraged. Check with us about reposting articles.